FILE - An eclipsed supermoon is shown on September 27, 2015 in Burbank California. Sky gazers have a special treat to look for later this month when a “supermoon” lights up the heavens. According to NASA, the November 14th full moon will be the closest full moon of this year, and the closest to Earth since 1948. It won’t be as close again until November 25, 2034. Even if the skies are cloudy on the 14th, the moon will still be very bright on the nights leading up to the supermoon. A supermoon is when the moon and Earth are closer than they usually are, if only by a small margin. The slight change, however, can cause the moon to appear up to 14 percent larger and 30 percent brighter than a normal full moon. The term supermoon is relatively new, having been created in 1979 by astrologer Richard Nolle. 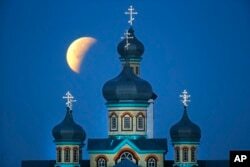 A so-called supermoon is seen at the finish of a lunar eclipse behind an Orthodox church in Turets, Belarus, 110 kilometers (69 miles) west of capital Minsk, Monday, Sept. 28, 2015. And if you miss the November supermoon, fret not. There will be another one on December 14. The bad news about that supermoon, according to NASA, is that it will drown on the view of the Geminid meteor shower.